Chilean Metals Inc. (TSXV:CMX, OTCQB: CMETF, SSE:CMX, MILA: CMX) has commenced drilling on the Bass River project at the Castlereagh prospect. Chilean Metals Inc. (“Chilean Metals,” “CMX” or the “Company”) (TSXV:CMX, OTCQB: CMETF, SSE:CMX, MILA: CMX). “We are very pleased to announce that we have commenced drilling on our Bass River project at the Castlereagh prospect. The target is a large electromagnetic anomaly that was identified first through VTEM and then recently refined by Minotaur Exploration Ltd.’s (Australia) analysis of the ground Pulse Electro-Magnetic (PEM) data collected by Clearview Geophysics Ltd” commented Chilean Metals President Mick Sharry. As outlined on the map below the initial drill holes are planned to test the strongest part of the late-time anomaly with pierce points approximately 100m apart alone strike and 60m apart down dip. 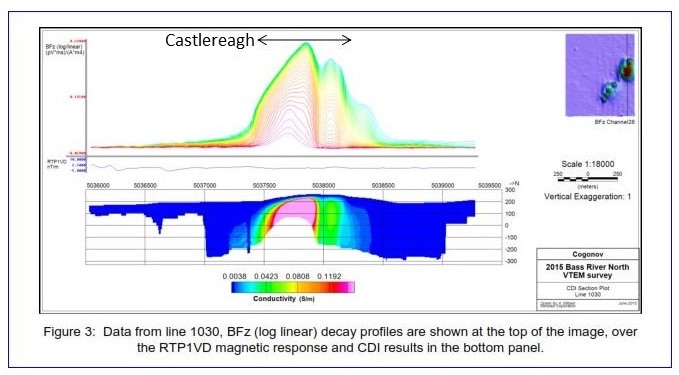 Minotaur Exploration Ltd (Australia) has confirmed the VTEM and PEM target at Castlereagh. The body is interpreted to have a strike length of 540 meters and a depth extension of 467 meters. The target dips 50 degrees to the southeast. Both airborne and ground work suggest the target extends to the northeast off of the survey grid. As suggested by both the airborne and ground geophysics and subsequent plate modeling, the Castlereagh Target is of substantial size and accordingly, should be tested by two initial drill holes. 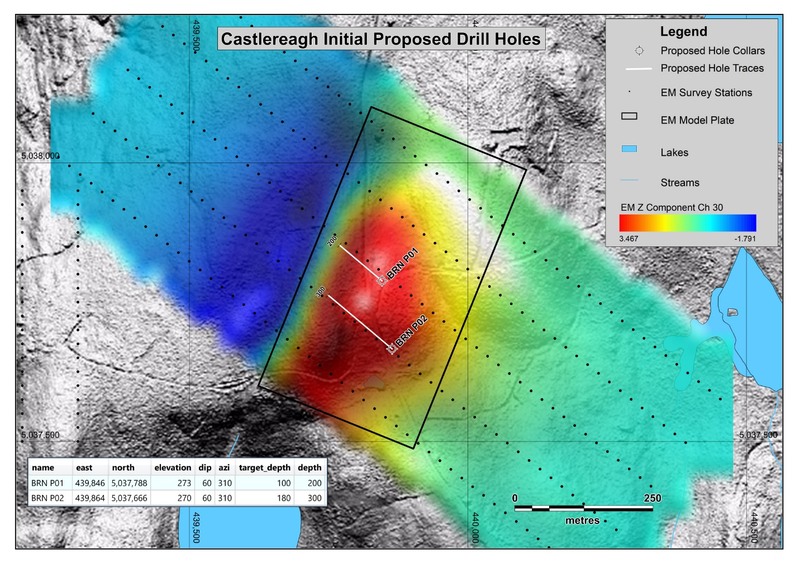 “We are very excited to be commencing drilling on the Bass River Castlereagh project. It is the first in a series of drilling programs we will launch over this summer and fall in Nova Scotia to test a number of large highly prospective Gold, Copper, Lead/Zinc/Silver and Cobalt targets. Nova Scotia is quietly becoming a very attractive mineral exploration location and Chilean is very excited by what it sees in its land package and is looking forward to delivering some positive news to our share and stakeholders.” commented Chilean CEO Terry Lynch. Chilean Metals Inc is the 100% owner of four Copper Gold exploration properties in Nova Scotia on the western flank of the Cobequid-Chedabucto Fault Zone (CCFZ); Fox River, Parrsboro, Lynn and Bass River North respectively. Initial targeting and geophysics has been conducted on all properties, At Bass River North, airborne geophysics identified a major VTEM cluster on trend with the Pb/Zn/Ag mineralization exposed at surface and in drill holes to the southwest. Modeling of the airborne data and subsequent Pulse Electro-Magnetic (PEM) data by Minotaur (Australia) identified 1 target of considerable size for priority drilling.